The Holiday Season may not seem like a great time to sell a home in Columbus. Most people are thinking more about gift lists and travel plans rather than house-hunting. However, those that are buying a Central Ohio home in November and December are generally serious and ready to buy. 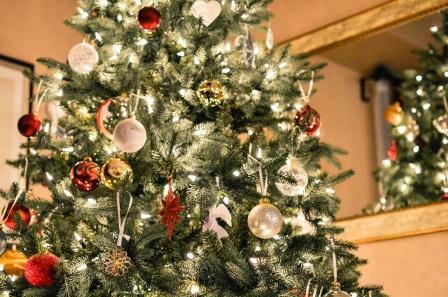 If you’re selling your home during the holidays, a few seasonal touches can really make your house feel like home to a potential buyer. With these holiday home staging tips, any buyer will be able to see themselves in your Central Ohio home. Any good home staging tip list must start here. If you’re home isn’t spotless and clutter free, decorations won’t help it appeal to buyers. Once you decide to put your home on the market, you have to look at every corner of your home with a critical eye. Throw away, donate, or pack up anything you don’t use regularly. Then, a serious deep clean is in order. Now is also the time to make those repairs you may have been putting off. Once you’re home is clean and basic staging is complete, add in a few seasonal touches such as fresh greenery or a bowl of pine cones. 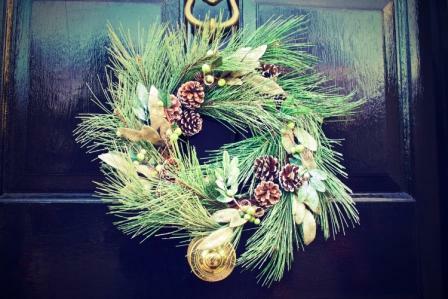 Putting up a seasonal wreath on your front door is the perfect way to add curb appeal and set the tone for home buyers. And, don’t forget to add the inviting scents of the holiday season by baking cookies or simmering some apple cider. Before you put out your entire holiday decor collection, think about your home’s color palette. For instance, if your living room is decorated in serene blues, opt for white and silver rather than bright reds or garish greens. If your home’s decor features earth tones, consider deep red and gold. While too many holiday decorations can be cluttered and distracting, a few well placed accessories can bring a buyer’s eye to your home’s best features. Create a warm, inviting reading nook at a bay window, or place tasteful greenery on your mantel to highlight your fireplace. Stage your dining room for a feast with a beautifully set table and seasonal centerpiece. Steer clear of the giant yard inflatables, too many lights, and holiday tchotchkes. Keep it simple and classy to impress Columbus area home buyers. If you put up a Christmas tree, make sure the tree fits the space and don’t over-crowd the branches with every ornament in your collection. Consider sticking with classic white lights and one or two colors of glass ball ornaments. You want buyers to imagine their own holidays in the home, and you want the home itself to stand out. The most important thing to do if your selling your Columbus home during the holidays is to work with a local real estate professional. This time of year, it is vital that your Columbus home be priced right for current market conditions. If you’re thinking about selling your Central Ohio home this holiday season, contact me, Rita Boswell, at 614-547-3229. I’ll help you prepare your home and price it correctly to sell as quickly as possible for as much money as possible.